Lock in a great price for The Au Co Cruise - Managed by Bhaya Cruise – rated 9.5 by recent guests! The trip exceeded our expectations which is not easy as we have been on cruises in the Galapagos and traveled extensively in Asia, South America, and Europe. Food, staff, service were all excellent. The balance between cruise time and excursions was perfect, and the excursions were interesting and well suited to the clientele. Everything! The food was creative, delicious and.beautifully presented. And the kitchen so accommodating! The staff was gracious, entertaining and friendly, and also very funny! The cabins were charming and comfortable, including many nice amenities. Finally, the activities on and off-board were fun, informative and very well organized. There was nothing not to like! Ha Long Bay is a breathtakingly beautiful place to visit. Not surprising that it is on most visitor’s itinerary. I highly recommend Au Co Cruise as a place to enjoy your stay in Ha Long Bay during a sojourn to Vietnam. The staff on board the auco were exceptional. Kevin the cruise manager was a wicked dude! Not cheap but this is a beautiful boat - 2 night itinerary worth the price as it takes you away from the crowded bay area. Great bicycle ride into Cat Ba island. Friendly young staff go out of their way to make your stay amazing. Knowledgeable, friendly guide (juan/john). Great food. The whole cruise was extremely well organised from start to finish. The staff, the activities, the facilities and the food were all very good. Staff were amazing, lovely ship. Only 12 passengers on board 😍, had a brilliant time with them all. Loved the excursions including the cycling to a local village and the kayaking through the caves. Lovely room and great food and friendly staff. The Au Co Cruise - Managed by Bhaya Cruise This rating is a reflection of how the property compares to the industry standard when it comes to price, facilities and services available. It's based on a self-evaluation by the property. Use this rating to help choose your stay! 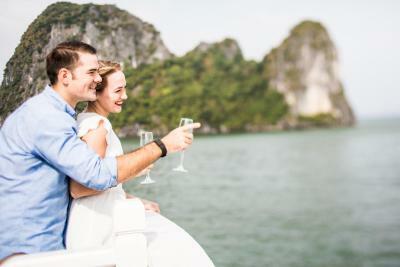 Sailing down the emerald waters of Halong Bay, Auco Cruiser offers luxurious air-conditioned cabins with free internet and a balcony with views. On-site activities include Vietnamese cooking lessons and snorkeling. All meals are provided. The modern cabins come with wooden furnishings and flooring, as well as a flat-screen TV and DVD player. A well-stocked mini-bar, as well as free mineral water, is included in all cabins. The luxurious bathrooms come with a shower or bathtub. Auco Cruiser sets sail from Tuan Chau Port in Halong, and travels through Cat Ba Island, Lan Ha Bay and Bai Tu Long Bay. Round-trip transfers from Hanoi, a 3-hour, 30-minute drive away, can be arranged at an extra charge. In the mornings, guests can take part in the daily Tai-chi sessions on the sun deck. Pampering massage and a hot tub are available at the spa. Foreign currency exchange and water sports equipment rental are also provided. International and Vietnamese meals are offered at The Dining Room. When would you like to stay at The Au Co Cruise - Managed by Bhaya Cruise? Located on the main deck, air-conditioned cabin comes with a private balcony and an private bathroom with bathtub. On-board insurance, taxes and service charges. This large room is located on the upper deck. A bathroom includes wood furnishings and a separate glass-enclosed shower stall. - On-board insurance, taxes and service charges. Located on the upper deck, spacious suite features an private balcony, sofa and seating area. A bathroom includes wood furnishings and a separate glass-enclosed shower stall. Located on the upper deck, suite suite features an soundproofed walls and a private terrace. A bathroom features a spa bathtub and a separate glass-enclosed shower stall. House Rules The Au Co Cruise - Managed by Bhaya Cruise takes special requests – add in the next step! One child under 6 years is charged VND 4648453.95 per night when using existing beds. All children under 2 years are charged VND 23359.07 per night in a crib. All children under 12 years are charged VND 4648453.95 per night for extra beds. The Au Co Cruise - Managed by Bhaya Cruise accepts these cards and reserves the right to temporarily hold an amount prior to arrival. A minimum stay of 2 nights is required to book rooms on this cruise. Please note that guests must make booking at least 24 hours in advance. Guests must provide full name, date of birth, nationality, passport number and Visa expiry date at the time of booking. Upon check-in on board, guests must present a valid passport or ID. The boat embarks at 12:00 sharp from Ngoc Chau Harbor, Tuan Chau Marina and Halong. If you require transportation, please contact the cruise directly. Contact details can be found on the booking confirmation. Rates are not inclusive of transportation from Hanoi to Ha Long and from Ha Long back to Hanoi. Please contact the cruise office directly for more details about transportation price, time and pick-up point. Contact details can be found on the email booking confirmation. It was beautiful. Rooms were ok.
We stayed in one of the smaller cabins which was still spacious, especially for a ship's cabin, but there was not much room for our bags and I had to bring the table in from the balcony to put things on. They call it a three day , 2 nights cruise . In reality you are on board for less than 48 hours . We did not get on to the ship until around 1pm on the Friday and we disembarked around 10.40 on the Sunday . Small point but maybe they just call it a 2 night stay instead..
At least water could be refilled in the rooms everyday, if not for tea and coffee! We had an awesome 2 nights stay on the Ao Co and would highly recommend. At first we were looking at cheaper options but are so happy we settled with the Ao Co, it was worth every penny. The boat was beautiful and very luxurious. The room was perfectly clean and had good space for a boat. The balcony was the highlight in the room. We had a 5 course lunch and dinner every day as-well as amazing breakfast spread. The staff are very accommodating of any particular food needs. The 3 days on the boat was packed full of activities which were all brilliant in particular the trip to Cat Ba Island. Lastly, the staff are really what make this cruise. They are so kind and friendly, they really made us feel welcome every second.